The annual Stewardship Science Academic Programs (SSAP) Symposium was held in North Bethesda, MD on February 17-18, 2016. CDAC Director Russell Hemley gave an overview of the Center and its accomplishments in the scientific program, education and outreach, and technical developments during the past year. The pdf file of the presentation may be accessed here. At the poster session, 17 CDAC graduate students presented their work. 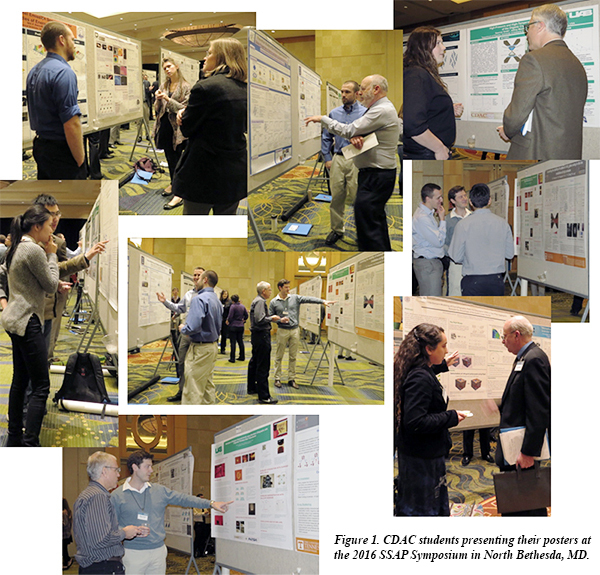 Attending the symposium were Will Bassett and Will Shaw (Illinois), Kierstin Daviau (Yale), Sakun Duwal (Washington State), Feng Lin (Utah), Josh Townsend (Northwestern), Jing Song (Washington University-St. Louis), Spencer Smith and Samuel Moore (Alabama-Birmingham), May-Ling Li (Illinois), Andrew Shamp (Buffalo), Hannah Shelton and Yi Hu (Hawai'i), Eloisa Zepeda-Alarcon (UC-Berkeley), Chris McGuier (UCLA), Jocelyn Rodgers (Carnegie/Georgetown), and Raul Palomares (Tennessee). Eloisa Zepeda-Alarcon received a Best Poster Award for her presentation. This is the third year in a row that she has received a Best Poster Award at this meeting.